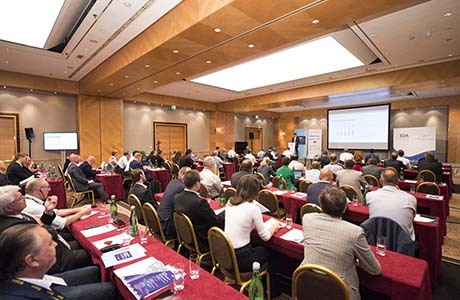 Contractors, manufacturers and associations of demolition industry in Europe met in the event, with the aim of protecting its interests around the continent. The high quality of the speakers in the Conference program, the presence of important sponsors in an active and friendly exhibitor’s area, an emotional Gala dinner, as well as, an enjoyable leisure program, became this event in a successful meeting for more 150 attendants. 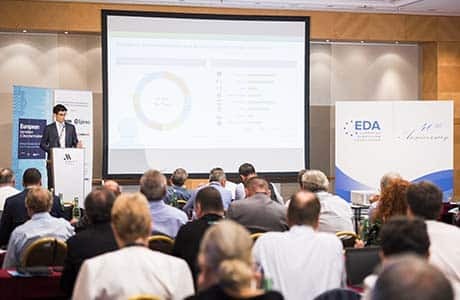 The first activities of the EDA Annual Convention 2018 were two workshops, one called “Demolition estimating, how to prepare the most qualified bid” and the other “Demolition project management: set up, implementation and closing the job”. Both workshops were leading by Mr. Michael Casbon, from the company ERM in USA, who kindly accepted the invitation of EDA. Both meetings were highly interesting for the attendants, who participated sharing opinions and making questions. After the workshops, and just before the Welcome cocktail, the EDA General Assembly was held with the objective of creating an overview of the demolition situation in each country, between others topics. The welcome cocktail was the last activity on Thursday, where all the attendants had the opportunity to salute their colleagues and enjoy a fantastic food, drinks and Piano live music. The President of EDA, Mr. William Sinclair, welcomed the people assembled with a speech where thanked the presence of all the assistants, sponsors and exhibitors. On Friday, at the same time of the professional program, there was a leisure program for the companions of the delegates, which consisted in a wonderful guide visit to St. Stephan Cathedral, the entrance to the Spanish horse riding school and free time for shopping. The professional program was moderated at the beginning to the end by Mr. Andreas Pocha, general manager of the German Demolition Association, DA, member of EDA. The conference started with a welcome by the president of EDA, William Sinclair, welcomed the almost 120 attendants in the Conference room thanking their presence and the support of the sponsors and exhibitors. The first presentation, called “Business intelligence about the European DDR (demolition, decontamination and recycling) activities”, was made by Mr. Martin Seban, of the IHS MARKIT. The presentation of Mr. Seban was full of data about European decontamination and demolition total market, breakdowns and forecasts, extracted from EUROSTAT and the IHS MARKIT. The second speaker was Mr. Fritz Kleemann, member of the Austrian Environmental Agency, who show a city-wide monitoring of demolished building and material through aerial images and gis models. Before the first coffee break, it was the turn of the first case story of the conference. Mr. Johann Ettengruber and Mr. Michael Appel, of the company ETTENGRUBER, explained an extreme demolition in the heart of Munich, Germany. This presentation was really completed, and it was made in German, but the attendants could follow it thanks to the interpretation service available in the conference room. Ms. Olga Mala, of PWC Luxembourg, continued with the conference program with a presentation called “European Construction Sector Observatory: general trends for resource and energy efficiency in construction”, that turned around the European Construction Sector Observatory, the ageing of the building stock and related investment needs, household renovation issues, construction waste generation and recovery and the policy response for resource and energy efficiency in construction. After her, the acting section head of the Decommissioning and Environmental Remediation Section, of Nuclear Energy Department of the International Atomic Energy Agency, IAEA, Mr. Vladimir Michal spoke to the attendants about considerations on decommissioning of Nuclear Facilities. This presentation was focus not only on decontamination but dismantling and demolition. Before lunch and networking’s time, Mr. Jakob Walchetseder, of the company BRAUN. The paper was about the requirements in dismantling of nuclear power plants, the procedure of dismantling, the modern technologies for dismantling of contaminated structures and the dismantling after decommissioning. The session 3 was opened by Ms. Julia Schimek, of the company PORR Umwelttechnik with the “Identification of materials (including hazardous substances) prior to demolition. The new Austrian regulation”. The presentation detailed the regulation for recycled building materials in the country who hosted the Annual Convention 2018, with a special attention to the rule ÖNORM B 3151. After her, it was the turn of Mr. Michael Casbon, of ERM, who apart from the workshops on Thursday, presented a topic under the title “Development of a Safety Manual for demolition operations, practical materials and better communication”. This presentation explained the development that has had the Safety Manual for Demolition Operations of the National Demolition Association in the US. Before the last coffee break, another case story was presented, this time, by Mr. Joe Brinkmann, from the company member of EDA, JET DEMOLITION. “Decontamination and demolition of petrochemical plants in South Africa” shared with the attendants the safety and demolition methods used through different examples. The last session was started by the president of the French Demolition Association, SNED, now SEDDR, Mr. Nathanael Cornet Philippe, who explained the evolution form one association to another. The last paper of the day was another case story called “Engineering analysis and demolition modelling for the GA Dome, Atlanta”, realized by Mr. Mahesh Raju Bailakanavar, of the company THORTON TOMASETTI. This paper was a perfect closing of the conference, because it gathered explanatory data, photos, examples and videos about how the constructions of this building. 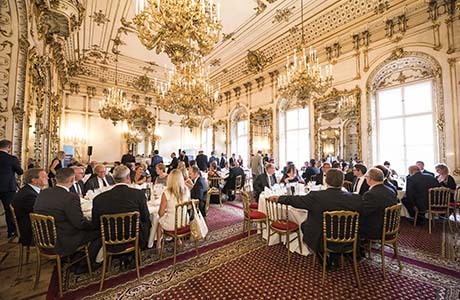 In the evening, the participants enjoyed a Gala Dinner in the fantastic Palais Pallavicinni, which provided a relaxed atmosphere to the professionals at the Annual Convention. At the end of the evening there was time for recognitions. First of all, the president of EDA, Mr. William Sinclair, name Mr. Jan Bork member of Club of Honor. Mr. Bork Jan has been involved with the foundation of one of the predecessors of VERAS, the Assocation of Demolition contractors who merged in 2009 into the new association VERAS. Since 1997 Jan was a member of the Board of the former demolition association. Later on he became chairman of VERAS in 2010. Mr. Jan Bork hold that position until 2017 when Kees de Groot succeeded Jan. Anyway Jan still continued his membership of the VERAS board. In that time, VERAS became immediately member of EDA and Jan was as chairman of VERAS head of the Dutch delegation on the EDA Conventions. 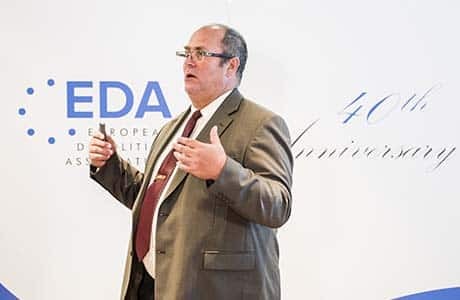 This meant the last action of Mr. William Sinclair as president of EDA, because just after that, in an emotional speech, he named Mr. Francisco Cobo as new president, who thanked the job done by his predecessor and committed himself to keep with the improvement of the association. Mr. Cobo has been highly involved in the associative world, both in Spain and internationally. He was the first Secretary General of the Spanish Demolition Association, AEDED, member of EDA, from its foundation in 1981 until 1990. 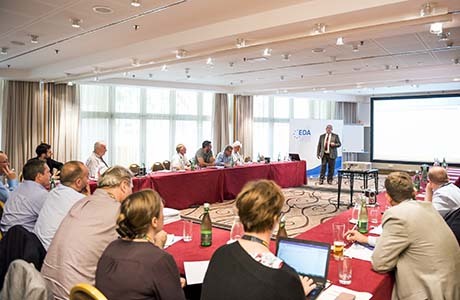 Mr. Cobo is present in EDA since many years, as he has participated in the Annual Convention (spring and autumn in the past), continuously, since the second edition, held in Hamburg (Germany) more than 35 years ago. In addition, he was one of the participants in the symposium EDA-Rilem, held in Tokyo (Japan), in 1988. 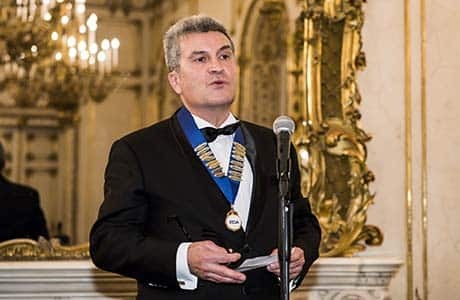 Since 2007, Mr. Cobo is the treasurer of EDA, role he still holds, and from 2013 to 2016, he was the president of the International Committee of the association. Finally, the first action of Mr. Francisco Cobo as president was to announce Mr. William Sinclair as a member of the Club of Honor. On Saturday, a group of 20 people enjoyed a leisure program that consisted in a guided tour on bus, and a visit to Schönbrunn palace and gardens. 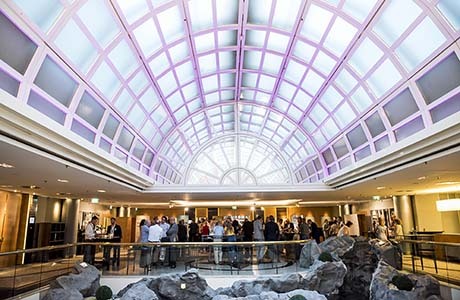 The next annual meeting of the European Demolition Association will consist in a study tour around Japan, that will take place in May 19-24, 2019. This event was celebrated once, in 1988, and achieved a resounding success. For five days, the contractors will have the opportunity to travel around the Asian country visiting different manufacturers and suppliers companies.